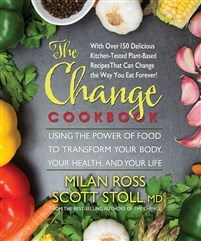 From the best-selling authors of The Change comes a new cookbook based on Dr. Stoll’s Immersion program for weight loss and better health. Imagine dishes that can reduce your cholesterol, lower your blood pressure, boost your immune system, and decrease your odds of getting cancer, type 2 diabetes, heart disease, strokes, and a host of other all-too-common health problems. Now imagine that the dishes are also delicious and easy to make. Here, in this new book, are over 175 recipes that can truly change your life for the better. The book begins by explaining why a diet that emphasizes whole plant-based foods is central to a healthy lifestyle. You then learn how to go about stocking your pantry and equipping your kitchen for success. Following this, the authors guide you in using a handful of simple cooking techniques that will enable you to prepare the dishes presented in the book. Along the way, they provide valuable tips that will smooth your transition from your current way of eating to a diet that will please your palate as it improves your well-being. The next eleven chapters of The Change Cookbook presents over 175 kitchen-tested recipes. Included are satisfying breakfast choices, nutrient-packed juices and smoothies, creamy dips and spreads, taste-tempting sauces and condiments, sensational salads, delectable sandwiches and burgers, fabulous main dishes, hearty one-bowl meals, steaming soups and stews, and creative side dishes. Finally, the authors provide a collection of fantastic desserts, including cookies, pies, fruit crisps and squares, puddings, and much more. Each recipe offers easy-to-follow directions that ensure success, and each dish is as nourishing as it is scrumptious. is divided into two parts. Part One begins with the journey taken by each author to develop such a cookbook. Everyone has the power to restore and maintain good health through a whole food plant-based diet. The Change Cookbook guides the reader in doing so, one satisfying meal at a time.